For this month’s Indian Cooking Challenge, I was very late to decide on a dish. It was so late that I hit on the first recipe that was on my draft. I am not sure where I got this recipe, it’s been in my filing for a long time. So it was a big risk that I was taking in suggesting to the team. As always I had decided on a off Saturday to venture into this but totally forgot to mix the batter and allow it to ferment. 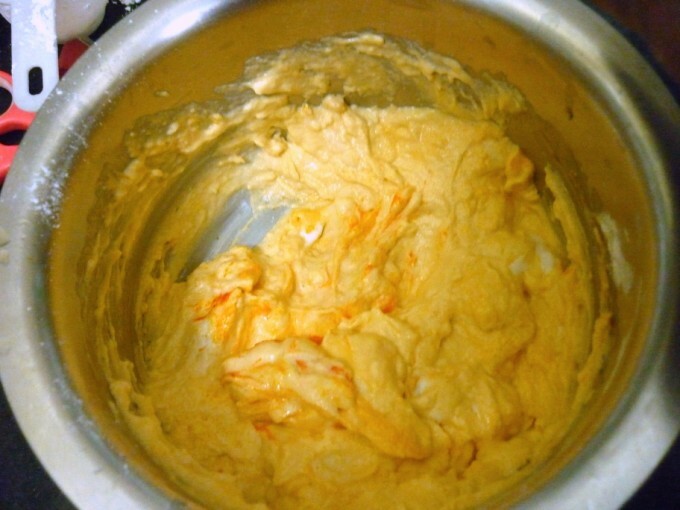 So I ended up mixing the batter in the morning and let it ferment through the day. Knowing our climate, I was sure it will all get fermented. We had earlier made Jangiri. Athamma was recollecting on how her neighbor used to make these Jalebis. Then my grandmom walked in and said that my grandpa used to make Jalebi. I was always told how well he used to cook, especially the traditional sweets and savories, I actually he was around to get the recipe. Thinking of Jalebi, remind me of another incident. For our wedding reception, Daddy arranged for hot Jalebi with Vanilla ice cream, a combination that wasn’t so famous 12 years ago. Daddy is always known for his style and way of doing things and this went on to become another of doctor’s well known acts. I can still remember the rush the dessert section had. We ran short of this even after he had planned for twice that number. We came to know that many went for second and third helping of the Jalebi. 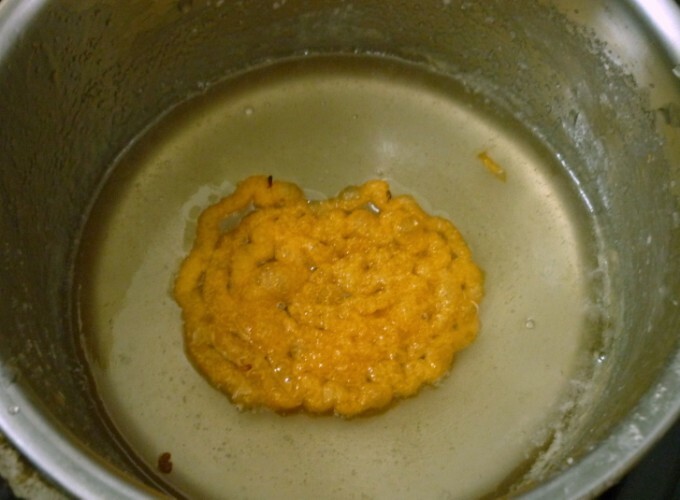 That was exactly what I was remembering when I took one bite of this Jalebi I made. No wonder, there is something remarkably addictive when you bite into a hot Jalebi, tart and sweet and full of sugary juice that gushes out. I had doubled the amount of flour I used and later seeing that I wasn’t getting crispy jalebis, I added more cornstarch as I went on. 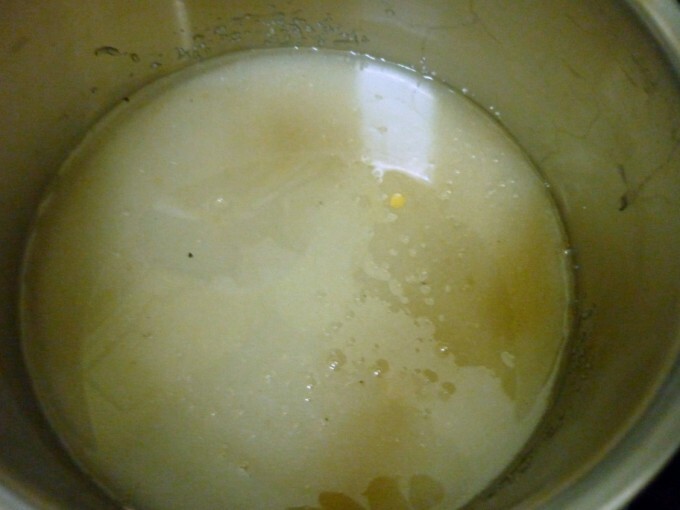 I must have added about 3 – 4 regular ladle full of the cornstarch which might equal to one more cup approx. This was the consistency I got after fermentation. 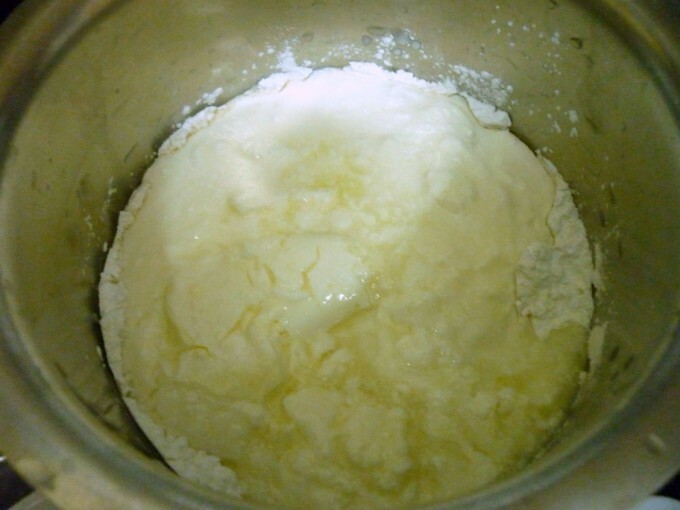 As I have mentioned it was too thin, so I added more cornflour and made it thick. 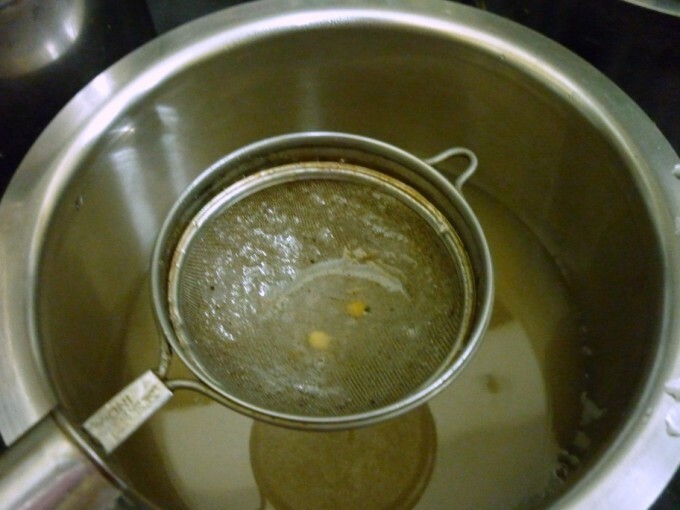 Water – Just enough to cover the sugar and melt. 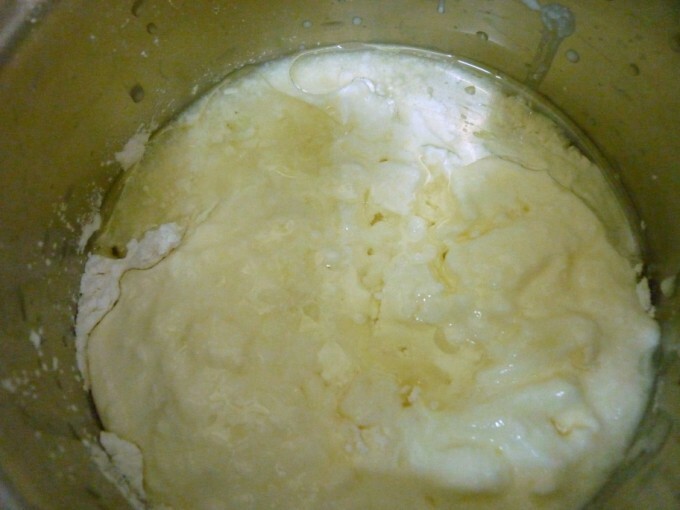 The recipe asks you to ferment the batter overnight. I completely forgot and mixed the batter at 10 am and left it to ferment till 4 pm. 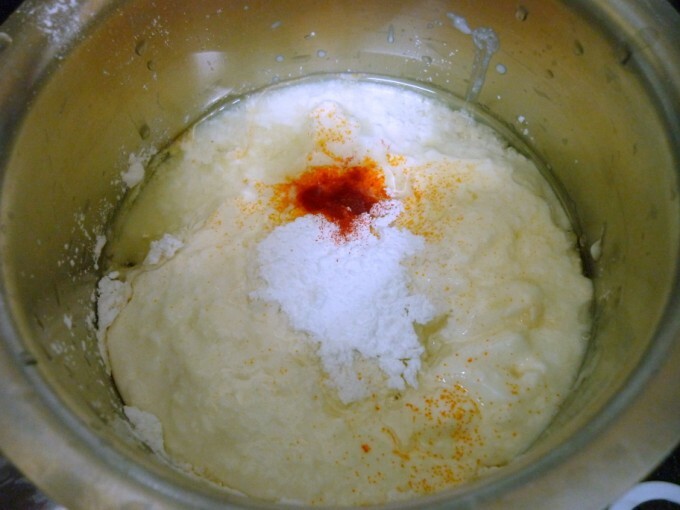 In a bowl, take the flour, add salt, then add in the curds, whisk well. 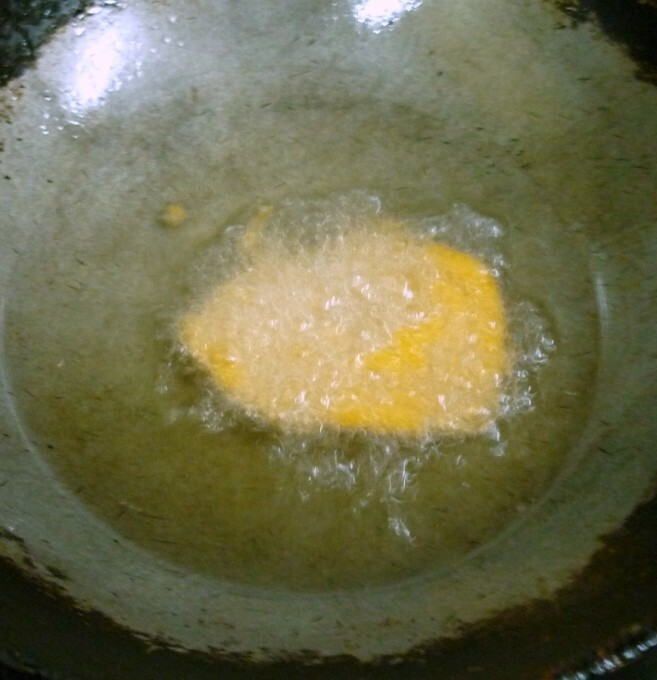 Then add lime juice, cornstarch, safron colour, and finally the hot oil. Mix everything well together and make sure there are no lumps. 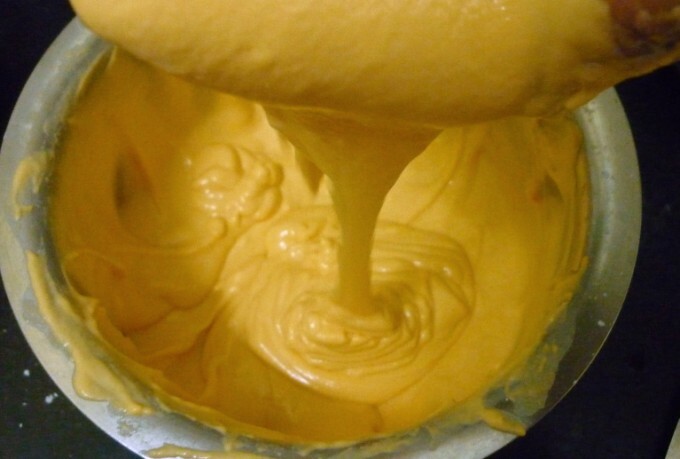 The batter needs to be thick. 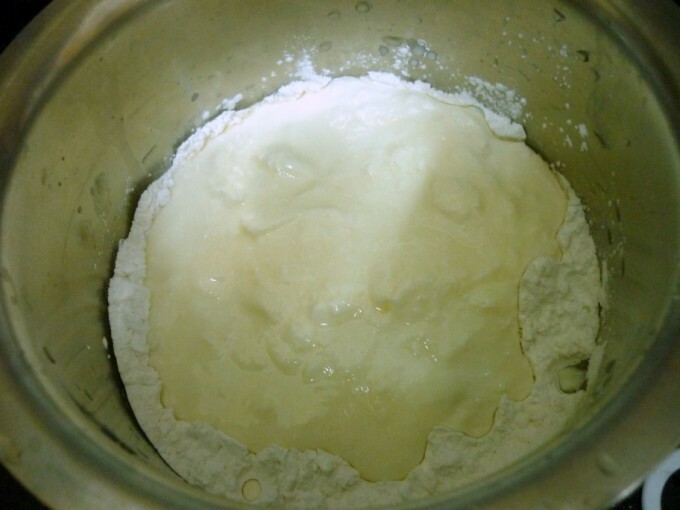 I mistook and made the batter little thin, so I had to add more starch to thicken the batter. Once this is done, set it aside to ferment. When the batter is all ready, get the sugar syrup ready. Take a pan with sugar, add just enough water to cover all the sugar. Keep stirring so that the sugar melts. Strain if required. Add line juice to avoid sugar crystallization. But few did after few days. Then again cook till you get a syrupy consistency. Keep it warm. Heat oil in a kadai. It is advised that once oil hot, you reduce to medium low flame. But I saw that my Jalebis were getting soggy when I do that. 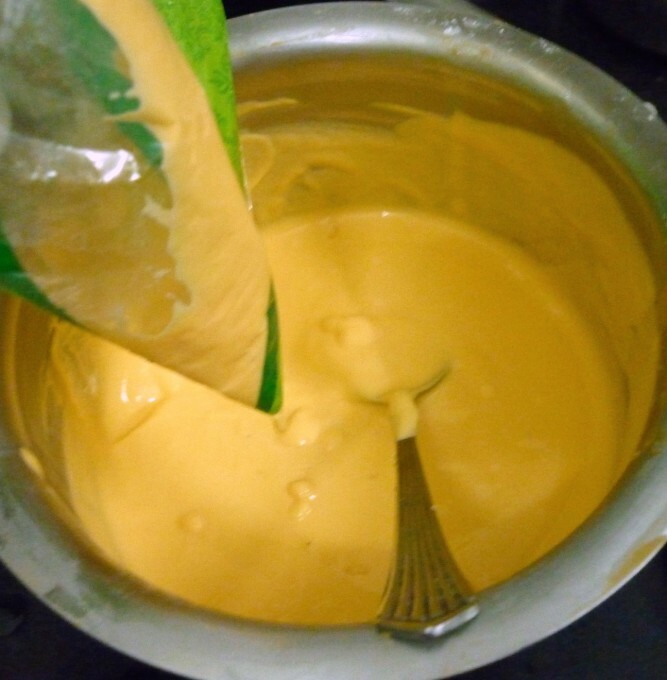 Spoon batter into a piping bag / zip lock bag or even your milk/ any thick plastic cover. Cut a tiny hole at one end, pipe the batter into the hot oil. Fry till it’s crisp and starts changing colour. This took about just couple of seconds for me, I had to be really quick with piping and turning the jalebis. Flip and cook on both sides. Once done, drop the hot jalebis into the warm sugar syrup. Done dunk them for long, flip on both sides and remove with a slotted spoon. This is best served hot/warm. Notes: I noticed that the batter had to be really thick for the Jalebis to be crisp. Also it helped when the oil was hot. I have read in other books that it is advised to reduce the flame to medium. This might be something one has to do seeing how it turns out for them. 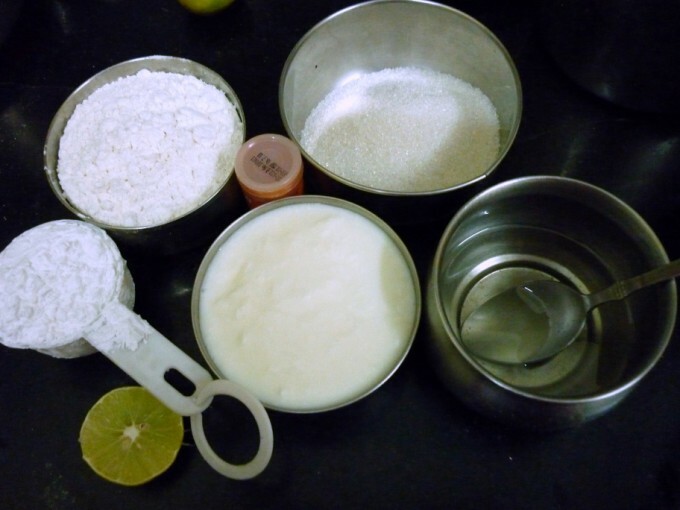 Lime juice gives that tart taste to the Jalebis, but I am told once the batter ferments overnight, it also aids to that effect, which is why some recipes don’t use lime juice. 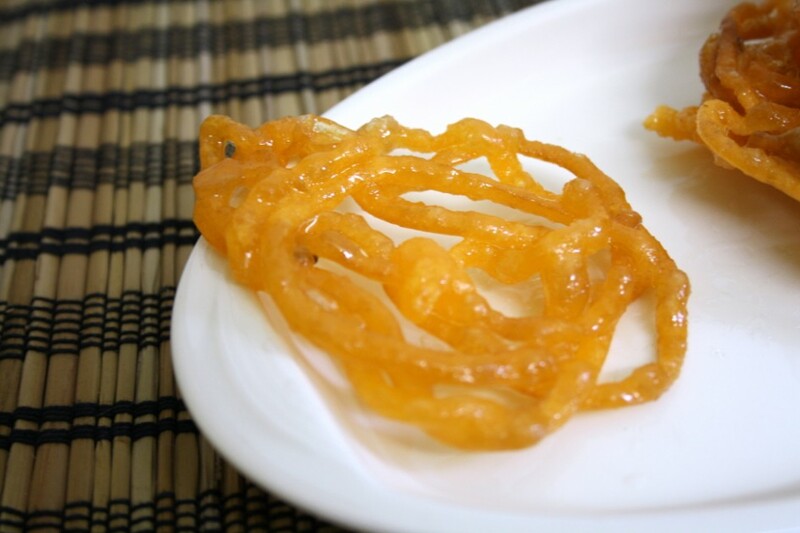 Having a really thin hole, makes sure your Jalebis turn out thin and crisp. To all my ICC members, please link your Jalebi post to Mr. Linky. Hi Valli,that yellow color looks fabulous.Hope you enjoyed the sweet. I have already linked mine.Thank you. Perfectly done Jelabi's Valli… I couldnt participate this month..
Wow! Srivalli your jabelis look awesome. I have linked mine. Your Jalebi's look perfect as u said,mine was crisp when hot but became soggy later so think the batter must have been watery.I will try next time keeping this in mind. Thank u! for the lovely recipe for ICC..enjoyed! What am amazing challenge. A life changer. Thanks a lot Srivalli. 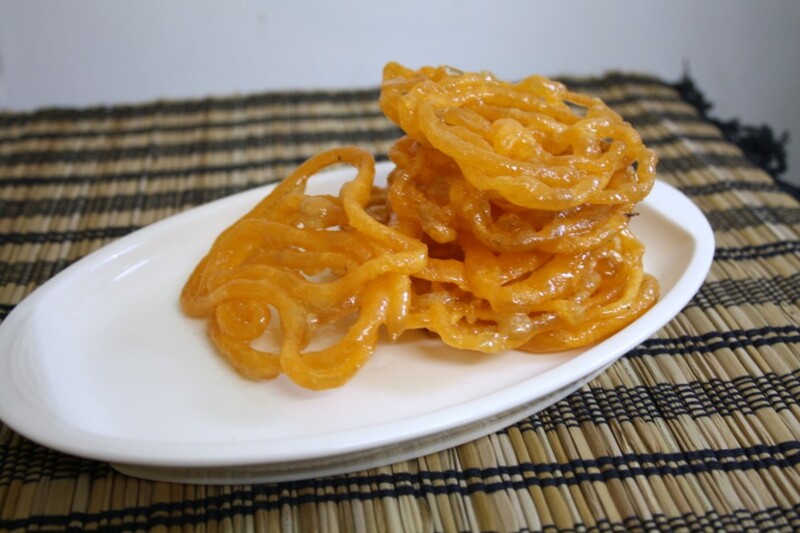 lovely jalebis…like u even i used to forget soaking the batter till i had to set an evening alarm to remind me! !…awsum recipe..next time will have to double the recipe:))thnks dear!! 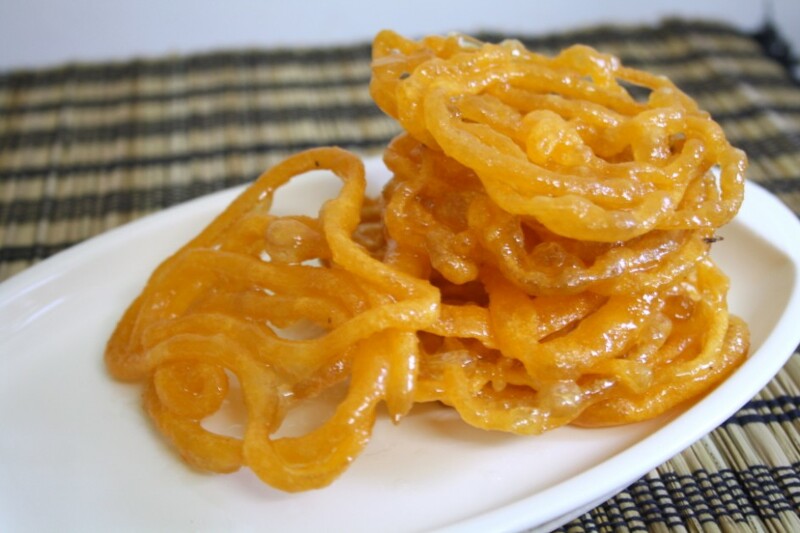 Wow…….what jalebis ……..V nice looking & maouth watering. They look perfect. Lovely jalebis, Valli. I was tempted to increase the cornstarch too but I guess there is always a next time. Anyways, Super challenge for sure!! my kids love this one sweet. Not tried in ages. Will make it now Thanks. Posted mine Srivalli…sorry for the delay. 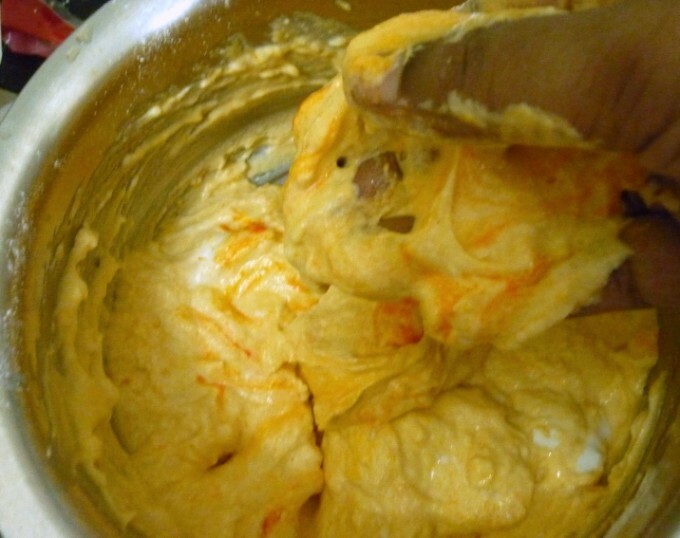 Thanks a lot for ur recipe…It came out very well…. tnx to you. i was able to m ake jalebis finally. 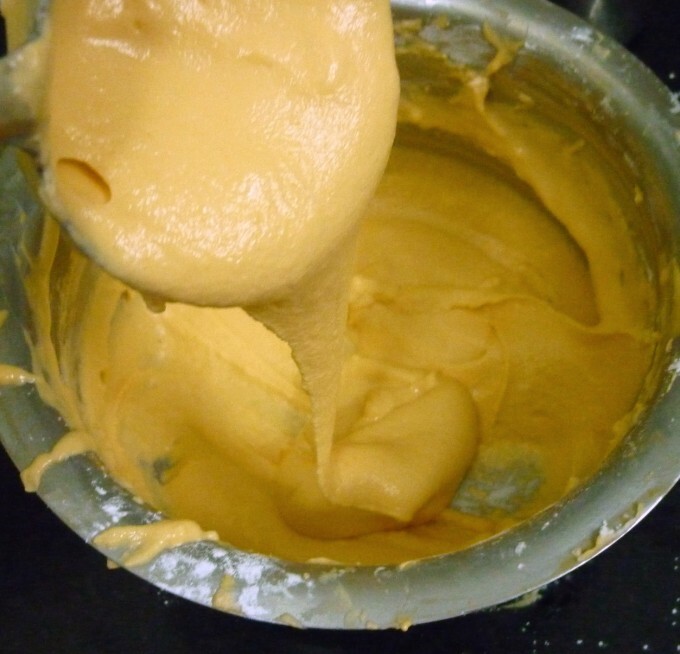 first time my batter was very thin and i had to throw that but you suggested me a thick one and i am successful now.